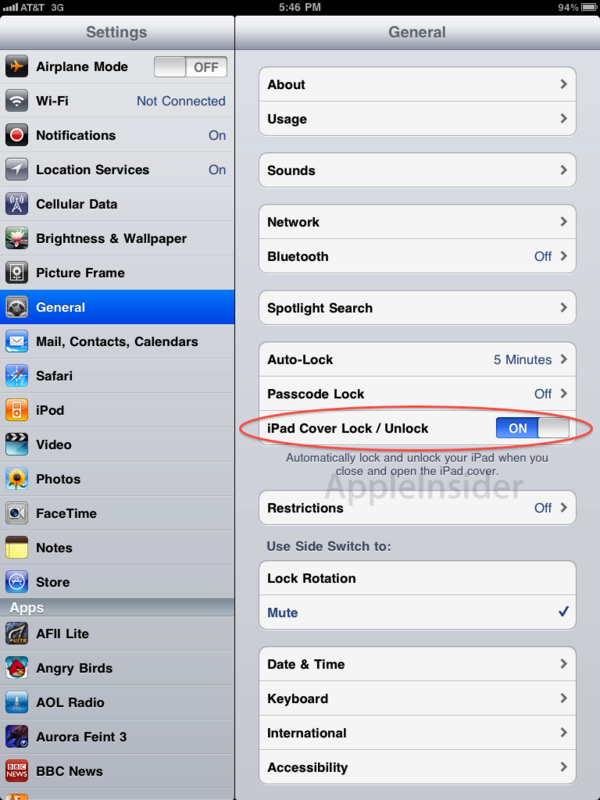 Marc Gurman at 9to5Mac has discovered a vulnerability on the iPad that allows for a limited bypass of the device’s lockscreen. Anyone with an iPad Smart Cover (or fridge magnet) can gain access to the previously-open app (or the home screen if no app was open). By holding the power button to bring up the ‘Power Off’ screen, closing the smart cover, re-opening it (or just sliding a fridge magnet along the right-hand side of the device), and clicking cancel, the attacker will be dropped into the screen that was open before the iPad was locked. If the attacker gets dropped into the home screen, then they’ll be able to see the installed apps, but won’t be able to open anything. If Safari or Mail (or any other app) was the open when the device was locked, then the attacker would have access to that app. Unlike Siri being available from the lock screen, which is not a security flaw (an unintended behaviour), this one actually is; and although an attacker does not get full control of the iPad, the severity depends on whether a sensitive app was being used before the device was locked. [Update] Apple did indeed patch this bug in iOS 5.0.1. Those of you who disabled your Smart Covers for security purposes can now re-enable them! I wasn’t going to post about last week’s fairly significant iTunes update, but then Apple went and patched a whole bunch of vulnerabilities across the board. Some of these are fairly significant so I thought I would provide a short breakdown of the changes. Either way, you should definitely be patching all of your Apple devices and software tonight. Hit the jump for a summary of the key vulnerabilities patched in Apple’s security updates. Apple has finally issued Security Update 2011-005 to address the recent issues around compromised Dutch certificate authority DigiNotar. It was discovered that at least 531 fraudulent SSL certificates were issued by DigiNotar, leading to their root certificate being revoked in all major operating systems and browsers over the past two weeks. A man-in-the-middle attacker in possession of one of these certs (eg. Google, Skype), would be able to intercept SSL-encrypted traffic to those sites. It is believed that the use of these fraudulent certs may have been limited to the Iranian government. Type DigiNotar into the search field in the top right. Right-click on the DigiNotar Root CA, and select Delete. Description: Fraudulent certificates were issued by multiple certificate authorities operated by DigiNotar. This issue is addressed by removing DigiNotar from the list of trusted root certificates, from the list of Extended Validation (EV) certificate authorities, and by configuring default system trust settings so that DigiNotar’s certificates, including those issued by other authorities, are not trusted. The two latest iOS updates are fairly significant in that they patch two critical vulnerabilities. iOS update 4.3.4 patched a number of bugs including comex’s PDF/FreeType vulnerability used to create the latest JailbreakMe exploit. If you’re a jailbreaker, it’s essential that you run comex’s ‘PDF Patcher 2’ within Cydia, in order to patch the underlying vulnerability. iOS update 4.3.5 released a couple days ago, patches a fairly significant bug in the way iOS validates SSL/TLS certificates. This vulnerability can allow an attacker to intercept and/or modify data protected within an SSL session without the user knowing it. This was possible to due the fact that iOS didn’t validate the basicContstrains parameter of SSL certificates in the chain. If you’re only an occasional patcher – now is the time. A fairly significant 0day vulnerability is being reported in the Skype client (< 5.1.0.922) for Mac OS X. By sending a specially-crafted instant message, an attacker may be able to remotely execute code on the recipient’s computer and gain access to a root shell. This issue has been discovered (by accident it seems) by Gordon Maddern of Australian security consultancy Pure Hacking. It is believed that due to the relative simplicity in the delivery of the payload, it may be possible for this attack to be automated in the form of a worm. Skype are aware of this issue, but have yet to release a patch (see below). Mac users should be extra careful until a patch is made available, and in the short term I recommend quitting Skype when not using it, or at least checking that your Skype client is set to only allow messages from your contacts (Skype > Preferences > Privacy Tab > Allow Messages From: Contacts). [Updated 8/5/2011] Skype addressed this vulnerability in version 5.1.0.922 of the Mac OS X client. Run the updater by going to the Skype menu > Check for Updates, or download the latest version here. Following the recent over-hyped “location tracking scandal“, Apple has released iOS 4.3.3 which fixes bugs in the Location Services on iPhone and iPad devices that caused them to store excessive location information. As detailed by Apple’s Q&A on Location Data, the location data stored on iOS devices (and backed up by iTunes) are merely a subset of Apple’s crowd-sourced location database of Wifi hotspots and cell towers, used to facilitate Location Services when GPS is unavailable or unreliable. The bugs were causing iOS to download this location cache even if Location Services were turned off, and to store the cache indefinitely, instead of being regularly purged. It’s nice to see Apple resolve this issue so swiftly, and these changes will help improve the privacy of iPhone and iPad users, regardless of whether they use Location Services. The only thing I would have added if I were Apple, is the ability for the user to clear the location cache in the device settings. It’s a button that could be easily added in Settings > Location Services. Just sayin’! WordPress have released a minor 3.1.1 update which patches an XSS flaw on the database upgrade screens. The change log also mentions a strengthening of security mechanisms relating to media uploads, and fixes to potential PHP crashes caused by complex hyperlinks. The update also includes a number of other security and bug fixes. It’s a fairly minor update that shouldn’t break any plugins. Update when ready. Apple has released 10.6.7 and its first security patch of the year, 2011-001, fixing a large number of bugs and vulnerabilities. In particular it fixes a known graphics bug in the 2011 MacBook Pros. It also improves Back To My Mac connectivity and SMB (windows file sharing). From a security perspective it fixes issues in a number of components including the Kernel, Airport, ImageIO, and QuickTime, many of which potentially lead to remote code execution. This update also adds detection for the OSX.OpinionSpy spyware to Mac OS X’s built-in file quarantine. In awesome day-before-just-to-try-and-screw-with-your-exploits style, Apple has released significant security patches for iOS, Safari and Apple TV. Safari, which is one of the targets at CanSecWest’s Pwn2Own contest where hackers come to demonstrate 0day exploits, has received an update to 5.0.4, and fixes over 62 bugs including major vulnerabilities in WebKit (eg. Errorjacking) and the ImageIO and libxml libraries. iOS 4.3 patches largely the same issues in MobileSafari, as well as a remote code execution vulnerability in CoreGraphics. iOS is expected to get a lot of attention at Pwn2Own, with at least four researchers having developed exploits. Charlie Miller and Dionysus Blazakis (@dionthegod) have one exploit which doesn’t work on update, although allegedly the vulnerability hasn’t been patched yet. Whether or not these updates thwart some of the exploits developed for Pwn2Own remains to be seen. It’ll be cool if it prevents at least one. Either way, good job to Apple for trying. Update: Just found out that target iPhones at Pwn2Own won’t be running the latest iOS 4.3 which does indeed prevent a number of exploits. Here’s a recap of the Pwn2Own action. Lastly, Apple TV has been updated to 4.2 to patch a couple not-so-critical vulnerabilities in libfreetype and libtiff that could allow code execution if a malicious image were opened. Apple has released Java for Mac OS X 10.6 Update 4 and Java for Mac OS X 10.5 Update 9, patching a number of vulnerabilities in the Java virtual machine. The most serious of these may allow an untrusted Java applet to execute arbitrary code outside of the Java sandbox. Users with Java installed should update soon. Those of you who don’t have Java don’t need to worry. If you’re unsure, just check Software Update. Apple recently announced that the version of Java ported by Apple for Mac OS X has been deprecated. Starting in Mac OS X 10.7 “Lion”, the Java runtime will no longer be installed by default, instead requiring users to install Oracle’s Java runtime should they require Java support. Apple also recently stopped bundling Flash with Mac OS X by default, with new MacBook Air and MacBook Pros shipping without Flash. The divesting of these two products will not only eliminate Java and Flash vulnerabilities on default installs of Mac OS X, it will allow users who install these apps to get updates quicker directly from Oracle and Adobe, instead of having to wait for Apple to release software updates. Hit the jump for details of the Java update for 10.6.